The Navien Premium Condensing Tankless Gas Water Heater (NPE-A) is a model that truly does shine. A tankless water heater saves you money. Rather than continuously reheating the water stored in a conventional water heater, this superior tankless system heats the water as it moves through the system, so the water is always hot and ready when you want it. With its Condensing feature, the efficiency quotient rises even more. Because this unit uses the condensation that is naturally produced by hot water to actually heat the water, energy costs are decreased immensely. With the Navien Premium Condensing Tankless Gas Water Heater (NPE-A), you could reduce your water heating costs by over 90%. The recirculating feature of this model allows you to recirculate the water in the pipes, keeping it hot and ready to dispense at a moment’s notice. With the cascading-capable ability, your hottest water is available at each faucet upon demand. 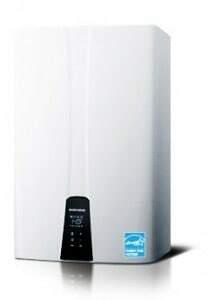 Click for more information on the Navien Premium Condensing Tankless Gas Water Heater.